Teachers are supposed to inspire the younger generation to follow their dreams and achieve great things. However, our hero, Nozomu is not that teacher. Nozomu's probably the most depressive man in Japan--so depressive, in fact, that every little setback in life inspires yet another suicide attempt! But then why is being in Nozomu's class such a blast? Is it his quirky and endearing students? The bizarre adventures he leads them on? Or is there something after all to "the Power of Negative Thinking"? RITES OF PASSAGE November means that it's time for the Shichigosan holiday, a rite of passage for all Japanese children. Of course, Zetsubou-sensei is quick to point out that rites of passage don't end with childhood. There are many different rites of passage in the world. For instance, a manga assistant's rite of passage is spilling coffee on the storyboards forthe first time. And we mustn't forget the important rite of passage that any true Zetsubou fan must undergo. What is it, you ask? 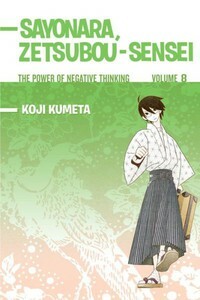 Why, buying a copy of Sayonara, Zetsubou-sensei Volume 8, of course! This volume of Sayonara, Zetsubou-Sensei includes special extras after the story!